Not to be confused with List of massacres in India. 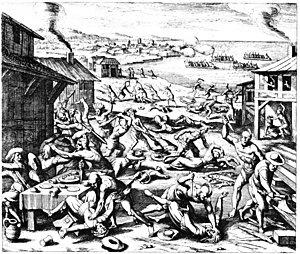 Indian massacre of 1622, depicted as a woodcut by Matthäus Merian, 1628. Massacre. European colonists were the first to use the phrase “Indian Massacre” which described massacres by Native Americans. The first originally termed instance of "Indian Massacre" occurred in 1622 at the Virginia colony of Jamestown. 347 men, women, and children of all ages. In the history of the European colonization of the Americas, an atrocity termed "Indian massacre" is a specific incident wherein a group of people (military, mob or other) deliberately kill a significant number of unarmed, defenseless people — usually civilian noncombatants — or to the summary execution of prisoners-of-war. The term usually refers to the killing of unarmed Native American women, children, and elders by colonists and the colonizing military forces. In historical usage, it has also been used by colonists to describe the actions of Native Americans killing colonists. "Indian massacre" is a phrase whose use and definition has evolved and expanded over time. The phrase was initially used by European colonists to describe attacks by indigenous Americans which resulted in mass colonial casualties. While similar attacks by colonists on Indian villages were called "raids" or "battles", successful Indian attacks on white settlements or military posts were routinely termed "massacres". Knowing very little about the native inhabitants of the American frontier, the colonists were deeply fearful, and as time passed, "far more white Americans eagerly consumed Indian atrocity stories around the family table and in popular literature and newspapers than ever interacted with Indians or witnessed an Indian raid." Emphasis was placed on the depredations of "murderous savages" in their information about Indians, and as the migrants headed further west, fear was the prevailing emotion behind their thoughts and actions concerning Indians. In some instances motivated by politics, in Colorado for example, "stories in the News continued to stir those fears: wild rumors of Indian conspiracies were heralded as fact; any violence at all between whites and Indians was reported as an Indian 'massacre'". The phrase eventually became commonly used also to describe mass killings of American Indians. Killings described as "massacres" often had an element of indiscriminate targeting, barbarism, or genocidal intent. According to one historian, "Any discussion of genocide must, of course, eventually consider the so-called Indian Wars", the term commonly used for U.S. Army campaigns to subjugate Indian nations of the American West beginning in the 1860s. In an older historiography, key events in this history were narrated as battles. Since the late 20th century, it has become more common for scholars to refer to certain of these events as massacres, especially if there were large numbers of women and children as victims. This includes the Colorado territorial militia's slaughter of Cheyenne at Sand Creek (1864), and the US army's slaughter of Shoshone at Bear River (1863), Blackfeet on the Marias River (1870), and Lakota at Wounded Knee (1890). Some scholars have begun referring to these events as "genocidal massacres," defined as the annihilation of a portion of a larger group, sometimes to provide a lesson to the larger group. It is difficult to determine the total number of people who died as a result of "Indian massacres". In The Wild Frontier: Atrocities during the American-Indian War from Jamestown Colony to Wounded Knee, lawyer William M. Osborn compiled a list of alleged and actual atrocities in what would eventually become the continental United States, from first contact in 1511 until 1890. His parameters for inclusion included the intentional and indiscriminate murder, torture, or mutilation of civilians, the wounded, and prisoners. His list included 7,193 people who died from atrocities perpetrated by those of European descent, and 9,156 people who died from atrocities perpetrated by Native Americans. Many of the incidents included on this list are not mentioned in Osborn's book. In An American Genocide, The United States and the California Catastrophe, 1846-1873, historian Benjamin Madley recorded the numbers of killings of California Indians between 1846 and 1873. He found evidence that during this period at least 9,400 to 16,000 California Indians were killed by non-Indians. Most of these killings occurred in what he said were more than 370 massacres (defined by him as the "intentional killing of five or more disarmed combatants or largely unarmed noncombatants, including women, children, and prisoners, whether in the context of a battle or otherwise"). This is a listing of some of the events reported then or referred to now as "Indian massacre". This list contains only incidents that occurred in Canada or the United States, or territory presently part of the United States. 1763 June 23 Clendenin Massacre West Virginia Shawnee massacre of Clendenin adult males, captured women and children including John Ewing of Virginia. ^ Osborn, William M. (2001). The Wild Frontier: Atrocities During The American-Indian War from Jamestown Colony to Wounded Knee. Garden City, NY: Random House. ISBN 978-0-375-50374-0. ^ a b Duncan, David Ewing (1997). Hernando de Soto: A Savage Quest in the Americas. University of Oklahoma Press. pp. 286–291, 376–384. ^ Clayton, Lawrence A., "Hernando de Soto: A Brief". ^ a b c Steele, Ian Kenneth, Warpaths: Invasions of North America, Oxford University Press, 1994. pp. 15, 47, 116. ^ Sauer, C., Sixteenth Century North America; the land and the people as seen by the Europeans, University of California Press, 1971, p. 141. ^ Flint, R., No settlement, no conquest : a history of the Coronado Entrada, University of New Mexico Press, 2008, pp. 144–153. ^ Brooke, James (February 9, 1998). "Conquistador Statue Stirs Hispanic Pride and Indian Rage" – via query.nytimes.com. ^ Weber, David J., The Spanish Frontier in North America, Yale University Press, New Haven, 1992, pp. 85–86. ^ Staff, Times-Dispatch. "Highway marker dedicated for Paspahegh tribe". ^ "Research Jamestown: Legacy of the Massacre of 1622 - Americans at War". www.bookrags.com. ^ Spencer C. Tucker; James R. Arnold; Roberta Wiener (30 September 2011). 'The Encyclopedia of North American Indian Wars, 1607–1890: A Political, Social, and Military History. ABC-CLIO. p. 332. ISBN 978-1-851096-97-8. ^ Muehlbauer, Matthew S.; Ulbrich, David J. (2013). Ways of War: American Military History from the Colonial Era to the Twenty-First Century. Routledge. p. 29. ISBN 9781136756047. Retrieved July 9, 2018. ^ Lucas, Beverly (2008). Wethersfield. Arcadia Publishing. p. 69. ISBN 9780738563459. Retrieved July 9, 2018. ^ Cave, Alfred A., The Pequot War, University of Massachusetts Press, 1996, pp. 144–154. ^ Winkler, David F. (1998). Revisiting the Attack on Pavonia. New Jersey Historical Society. ^ Beck, Sanderson (2006). "New Netherland and Stuyvesant 1642–64". ^ LaPlante, Eve (2004). American Jezebel, the Uncommon Life of Anne Hutchinson, the Woman who Defied the Puritans. San Francisco: Harper Collins. p. 231. ISBN 0-06-056233-1. ^ Trelease, A., Indian Affairs in Colonial New York; The Seventeenth Century, pp. 79–80. ^ Karnoutsos, Carmela (2007). "Peach Tree War". Jersey City A to Z. New Jersey City University. Retrieved February 17, 2013. ^ "King Philip's War Breaks Out". www.massmoments.org. ^ George, Charles; Douglas Roberts (1897). A History of Canada. Boston: The Page Company. pp. 93–94. ^ a b "The Tuscarora War (1711–1715)". ^ "Drapers Meadow: Few traces remain of the site of a bloody 1755 Indian attack". The Roanoke Times. Archived from the original on September 30, 2012. Retrieved November 14, 2007. ^ "Pennsylvania Historical and Museum Commission - The Battle of Wyoming and Hartley's Expedition". ^ Belcher, Ronald Clay, (2011) Westervelt Massacre in Kentucky in 1780. Blue Grass Roots. Quarterly Journal of the Kentucky Genealogical Society. Frankfurt, Kentucky. Vol. 38, No. 2, pp. 30-37. ^ "Dietz Massacre". Archived from the original on February 15, 2008. ^ Wilcox, G.T., An account of the Long Run Massacre and Floyd's Defeat as told by G. T. Wilcox, Squire Boone's Grandson in a letter to Hon. Thos. W. Bullitt. Kentucky Genealogy 28, June 2000, accessdate December 28, 2012. ^ Akers, Vincent J. History of Painted Stone Station. Painted Stone Settlers Organization. 2012, accessdate December 28, 2012. ^ Asche, J. L. "Tuscarawas County, Ohio". freepages.genealogy.rootsweb.com. ^ Denetdale, Jennifer Nez, Reclaiming Diné History: The Legacies of Navajo Chief Manuelito and Juanita, University of Arizona Press; 2007, p. 56. ISBN 978-0-81652-660-4. ^ Allison, Harold (©1986, Harold Allison). The Tragic Saga of the Indiana Indians. Turner Publishing Company, Paducah. ^ "Fort Sinquefield". Clarke County Historical Museum. Retrieved November 27, 2008. ^ Borneman, Walter R. (2004). 1812: The War That Forged a Nation. page 149. Harper. ISBN 9780060531126. ^ Steve Rajtar. 1999 Indian War Sites: A Guidebook to Battlefields, Monuments, and Memorials, State by State with Canada and Mexico. McFarland. ^ Missall, John (2004). The Seminole Wars: America's Longest Indian Conflict. Florida: University Press of Florida. pp. 36–37. ^ Himmel, Kelly F. (1999). The conquest of the Karankawas and the Tonkawas, 1821-1859. College Station: Texas A&M University Press. ISBN 978-0-89096-867-3. ^ "The Fall Creek Massacre". Conner Prairie. Archived from the original on April 23, 2012. Retrieved April 16, 2012. ^ May, Jon D., "Battle of Cutthroat Gap" Encyclopedia of Oklahoma History and Culture, retrieved May 24, 2012. ^ Dean, Kenneth Remembering The Killough Massacre, June 21, 2010, East Texas News, Tyler Paper, accessed February 16, 2013. ^ Abbott, Peyton O., Webster massacre, Texas State Historical Association, Handbook of Texas Online, accessed February 16, 2013. ^ a b c d e Madley, Benjamin An American Genocide: The United States and the California India Catastrophe, 1846–1873, Yale University Press, 2016. ^ Farmer, Jared (2008). On Zion's Mount: Mormons, Indians, and the American Landscape. Harvard University Press. p. 76. ISBN 9780674027671. ^ Heizer 1993, Letter, Bvt. 2nd Lieut. John Nugens to Lieut T. Wright, December 31, 1853, pp. 12–13,. ^ "Native Americans attack Americans at the Cascades of the Columbia on March 26, 1856. – HistoryLink.org". www.historylink.org. ^ "65 Yuki Indians Killed at Bloody Rock - Find A Grave Memorial". www.findagrave.com. ^ Rohde, Jerry (February 25, 2010). "Genocide and Extortion: 150 years later, the hidden motive behind the Indian Island Massacre". North Coast Journal. Retrieved December 26, 2012. ^ Thrapp, Dan L. (1979). The Conquest of Apacheria. Norman, OK: University of Oklahoma Press. ISBN 0-8061-1286-7. ^ Vredenburgh, Larry. "Keyesville Indian Massacre of April 19, 1863". vredenburgh.org. ^ Browne, R. John, Adventures in the Apache County: a tour through Arizona and Sonora with notes on the silver regions of Nevada. 1869. New York: Harpers & Brothers Publishers. ^ Smiley, Brenda "Sand Creek Massacre", Archeology magazine. Archaeological Institute of America, accessdate December 26, 2012. ^ Peter Gottfredson. History of Indian depredations in Utah. Fenestra Books. ISBN 978-1587361272. ^ Modoc NF History, 1945 – Chapter I, General Description United States Department of Agriculture, Forest Service. ^ "Headlines: Error Page". www.historyandtheheadlines.abc-clio.com. ^ "Colorado Humanities - Sand Creek Memorial and Washita Sites". Archived from the original on February 27, 2012. ^ Giago, Tim, "Honoring Those Who Died at Washita"
^ "The 140th Anniversary of the Washita Massacre of Nov. 27, 1868 - Native American Netroots". www.nativeamericannetroots.net. ^ Terrell, J., Land Grab, pp. 4–10. ^ "The Indian Attack Upon an Arizona Stage The Driver and Five Passengers Killed". The New York Times. November 20, 1871. ^ "The Late Frederick W. Loring" (PDF). The New York Times. November 24, 1871. Retrieved December 26, 2012. ^ Hildebrandt, Walter. "Cypress Hills Massacre". The Encyclopedia of Saskatchewan. University of Regina. Retrieved March 28, 2008. ^ Greene, Jerome A. (2000). "6". Nez Perce Summer 1877: The U.S. Army and the Nee-Me-Poo Crisis. Helena, MT: Montana Historical Society Press. ISBN 0-917298-68-3. ^ "Milk Creek battlefield". National Park Service, US Department of the Interior. Retrieved March 17, 2008. ^ "Milk Creek battle (or Meeker Massacre)". Meeker Colorado Chamber of Commerce. Archived from the original on November 17, 2007. Retrieved March 16, 2008. ^ "Alma Massacre, Pioneer Story, New Mexico". October 7, 2008. Archived from the original on October 7, 2008. ^ "Book Review, The Last Massacre". The New York Times. January 17, 1988.